Time's Up Advertising is evolving into a full-fledged movement for fighting bad behavior in advertising. January marks the one-year anniversary of an email chain that included 14 prominent female ad industry leaders who came together because they were—and still are—fed up with sexual harassment in the workplace. Those emails quickly turned into phone calls, which became meetings and led to a movement now known as Time’s Up Advertising. Today, nearly 200 agency executives have pledged they will no longer accept bad behavior, discrimination and inequality. 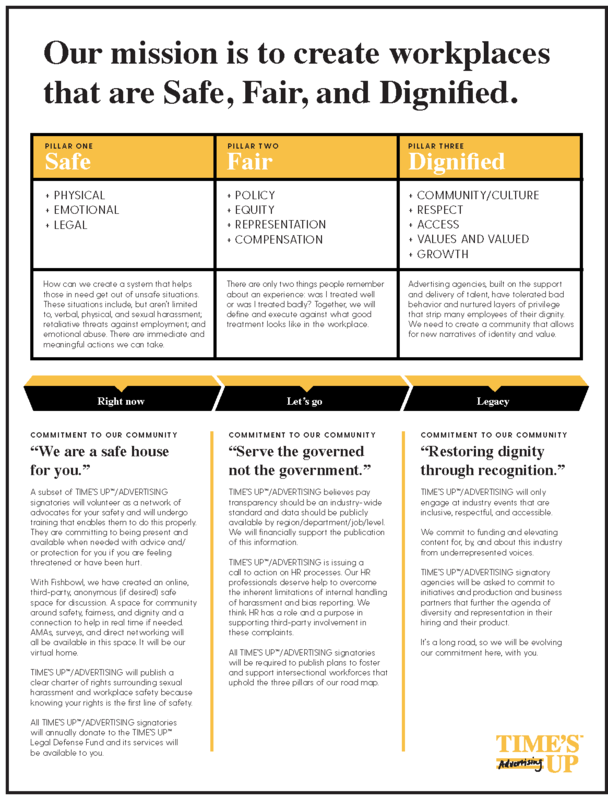 The organization is led by a steering committee that recently released a charter with three clear pillars for the type of workplace it aims to create: safe, fair and dignified. It has also forged partnerships across the larger Time’s Up initiative in industries including tech and entertainment. In October, Time’s Up Advertising unveiled a partnership with chat app Fishbowl that will allow for an anonymous, women-only group dedicated to the movement to provide others with links to resources and an email line to report incidents of sexual harassment or other forms of abuse. What began in early 2018 as a call for better workplace culture has taken on a life of its own and evolved into a full-fledged organization. The Time’s Up Advertising steering committee, whose members collectively responded to Adweek’s questions via email, said they didn’t originally intend to start such an entity. Today, the committee is planning to create a more formal structure and is preparing to announce its first full-time executive director and project coordinator. Still, Time’s Up Advertising remains very much a grassroots organization. For example, Mara Lecocq, a freelance creative director who founded the interactive database for senior female ad executives Where Are The Boss Ladies?, has been helping BBH New York chief strategy officer and chairman Sarah Watson, a Time’s Up Advertising steering committee member, and Fishbowl co-founder and chief operating officer Loren Appin launch Fishbowl’s dedicated Time’s Up Advertising group. “Sometimes it’s daunting, but we look around at the women beside us and feel optimistic that we can create change because there are a lot of badass women fighting for this,” they said. For example, the community responded with anger after Time’s Up Advertising decided to limit access to its first meetings to women with full-time agency jobs. This initially barred freelancers and people who had left the industry–some due to the very issues Time’s Up Advertising was formed to address. Another issue was the way the group dealt with the question-and-answer segments of those initial meetings. Attendees voted to determine which questions it addressed, and multiple parties who were there indicated that questions posed by women of color were largely ignored. "It’s a lot easier to advocate on behalf of mainstream or white women than it is to advocate on behalf of women of color." Producer Kai Deveraux Lawson, a veteran of agencies including AKQA and Wunderman who co-hosts the Mixed Company podcast, said she went to the New York meeting feeling “optimistic” but left disappointed. She said she remains skeptical Time’s Up Advertising can truly represent her and other women of color. Seven of the steering committee’s 12 members are women of color. The committee said they will make the “issue of equity and dignity for women within the workplace, especially women of color, our first priority.” Its first focus will be to elevate women of color throughout the industry and to partner with other organizations dedicated to doing the same. The Time's Up Advertising steering committee when DDB CEO Wendy Clark was still a member. All other members are still active. According to several sources who spoke with Adweek on the condition of anonymity, much of the handling of the criticism regarding Time’s Up Advertising has fallen on the shoulders of Wieden + Kennedy co-president Colleen DeCourcy, who has arguably been the most visible member on the steering committee. Lawson herself approached DeCourcy with her concerns over the first meetings at this year’s Adcolor conference in Los Angeles. DeCourcy apologized and invited her to publicly voice her concerns at the Time’s Up meeting during industry event AW New York. Sources close to the matter said those involved in Time’s Up Advertising largely continue to support Clark because the movement is still at a critical stage when unity is imperative. It’s telling that the industry looked to Time’s Up Advertising as the legitimate authority to take action on the incident, the sources said.